Seada Technology recently provided R ONE in Hong Kong with 3 G4K Pro Creative Video Wall Controllers. These controllers allowed the co-working space to put together a 12 screen, 6×2 video wall in its event area. The One Pacific Centre, Kwun Tong, R ONE building is used mainly for large events and office space. They aim to fully support and nurture all co-workers’ business ventures, with R ONE’s advanced range of technological resources, professional supports and community network. R ONE is a ‘’Flexible, Interactive, One-stop Creative Technology Community”. The G4K Pro standalone serial video wall controller was a perfect solution for this events room, as each unit can be daisy chained together to allow the input source content feature over not just 4 screens but as many, 12 in this case, as necessary. The controller can accept a single 4K input source and divides it across up to four displays, each with a resolution up to 1920×1200 @ 60Hz. Each output supports rotation of any degree and can be upscaled and downscaled freely for all sorts of applications. The G4K Pro allows the user to be flexible, and although R ONE are currently using the units at zero degrees, they have the option for further creativity should they need to in the future. 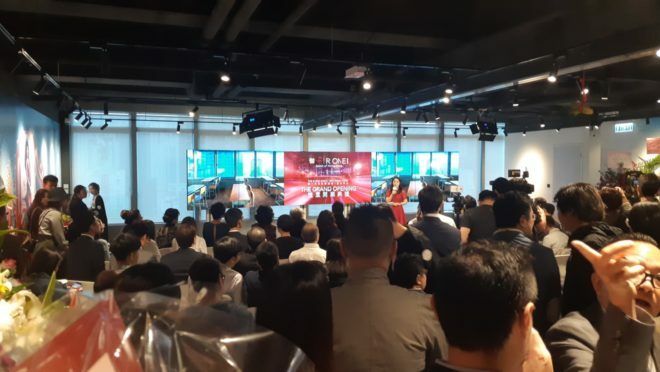 As you can see in the accompanying pictures, the video wall has been implemented for the grand opening of the building and has already been used as the backdrop for an important presentation. The display showed the packed out room a glimpse into what the building will be used for and gave the many spectators an idea of the vast potential that the One Pacific Centre has. Seada are extremely proud to have been apart of the beginning of this buildings history and we hope that we can continue to provide R ONE with a great service in the future.